Using performance metrics enables designers to show a design’s value and make the case for sustainable landscape solutions. As a landscape architect, I’m increasingly asked to provide performance targets for my designs. Whether I’m advocating for installing a green roof, providing a space for social engagement, or planting more trees, data helps clients understand the long-term value of these decisions, and align our visions. Landscape architects must be able to speak to a design’s performance, which is where data becomes crucial to support a claim. Being able to make rough performance calculations, and having evidence to support decision-making in the infancy of a design, is crucial to the successful implementation of a design vision. This newfound need to quantify and measure the impacts of design decisions has brought about collaborations and research that is transforming the practice of landscape architecture. Many resources are now available to quantify the likely results of a project goal and determine the value of a landscape. The development of peer-reviewed methods of evaluating environmental impact has emerged, and a number of case studies, toolkits, and resources are available to help better define how to achieve sustainability. The Sustainable Sites Initiative™ (SITES®) is the first comprehensive rating system for the design, construction, and maintenance of sustainable landscapes. The rating system provides a wide-ranging set of guidelines needed to measure the performance and the value of sustainable landscapes. Applicable to projects varying from 2,000 square feet to over 200 acres, the program aims to ensure that landscapes are planned, designed, developed, and maintained in a way that either avoids, mitigates, or even reverses the harmful impacts on the environment. SITES advances best practices in landscape architecture and ensures clients that their project has achieved field-tested standards for sustainability. The Landscape Architecture Foundation’s Landscape Performance Series is another online resource for quantifying the value of the landscape. With over 100 case studies and dozens of toolkit calculators, the Landscape Performance Series aims to transform the way landscape is considered in the design and development process. Bringing together innovations from research, industry, academia, and professional practice, the website is a handy place to find precedents, explore metrics, and make the case for sustainable landscape solutions. The American Society of Landscape Architects (ASLA) also provides a number of sustainable design resources, including toolkits and guides. The toolkits are broken down into environmental, economic, and social models. The resources are a compilation of the available assessment tools, checklists, and modeling software for a variety of projects and project goals. ASLA has also compiled 40 case studies, which highlight the transformative effects of sustainable landscapes. These tools are aimed at putting sustainable design theory into practice. Recently, I have become increasingly involved in performance metrics, delving deep into the available resources and even receiving SITES AP credentials. Being able to pull from existing resources and project examples has made the process more manageable, as I try to more fully integrate performance metrics into my practice. Data allows me to evaluate my design decisions, and make sure I’m proposing the best solution for my client. At LandDesign, we’re using metrics to elevate our design process and prove the value of our work. 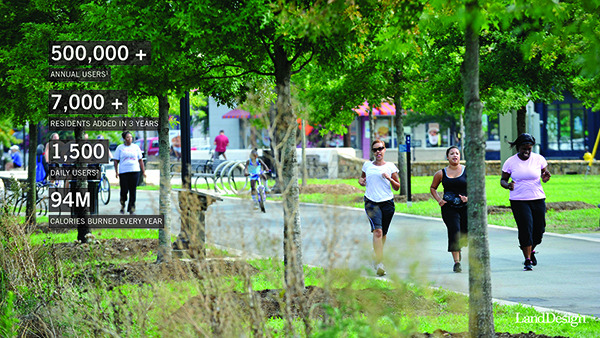 In undertaking the master planning of the Little Sugar Creek Greenway, LandDesign’s goal was to strike a balance between environment and community. For decades, much of the severely polluted creek was hidden beneath a concrete cap. 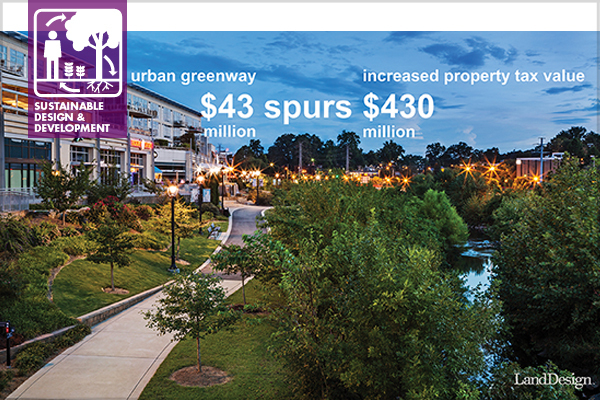 By understanding and communicating the benefits of removing pavement and reshaping the creek’s banks, LandDesign was able to transform the creek into a community amenity. 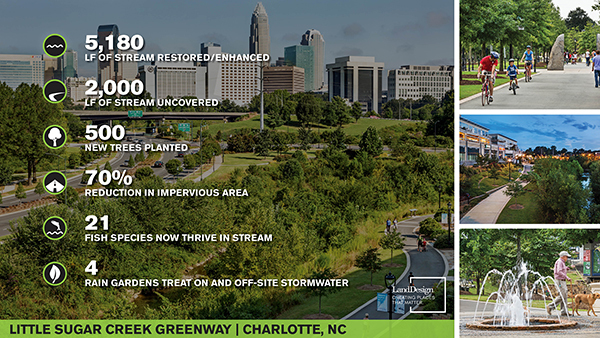 Implementation of this urban greenway has restored critical ecological systems, created a recreational destination, and brought economic revitalization to midtown Charlotte. New metrics and guidelines are helping to better define the benefits of sustainable landscape design, allowing designers to test their methods, become better practitioners, and speak authoritatively about the environmental benefits of sustainable landscapes. They also ensure that project’s perform to the quality the client expects. As practitioners we have a unique opportunity to both utilize and advance this important work, creating landscapes that provide clear sustainable performance, and, eventually, elevate the practice as these metrics create new standards. This article was originally posted on the DeepRoot blog under the title “Performance Metrics For Sustainable Landscapes” and has been slightly modified. This is a very interesting article, I have been thinking and researching on this topic for some time, on how crucial it is for us, Landscape Architects, to prove the worth of our design and its performance on various aspects at the conceptual stage itself and how important each tree is and its ultimate contribution would be. Since its been some time since you wrote this article, it would be interesting to know where this has led you.